To celebrate National Heart Month, world-renowned artist, scientist, conservationist and entrepreneur Dr. Guy Harvey has designed a limited edition performance shirt to benefit the American Heart Association’s Life Is Why We Give™ campaign which inspires consumers to honor their reasons to live longer, healthier lives. 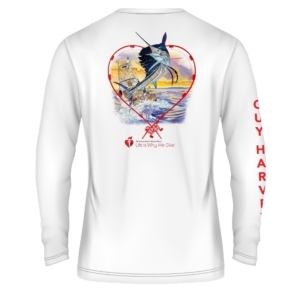 The colorful long sleeve performance shirt features Guy Harvey’s iconic marlin design framed by two red fishing rods in the shape of a heart. Available now in men’s and women’s sizes at https://www.guyharvey.com/heart.html, the Guy Harvey American Heart Association long sleeve performance shirt is priced at $40 and is the perfect gift for Valentine’s Day. For every American Heart Association shirt sold online, Guy Harvey will donate $24 to support the efforts of the American Heart Association, which funds lifesaving research, educates consumers on healthy living, and aims to reduce disability and deaths caused by cardiovascular diseases and stroke. Follow Guy Harvey on Facebook at https://www.facebook.com/DrGuyHarvey or Twitter and Instagram at @DrGuyHarvey.